Your garage door doesn't rise and lower on its own. It uses a system of either torsion or extension springs in order to do that. Dealing with this type of system can be incredibly dangerous, as these components are loaded with a tremendous amount of tension, and any mishandling can lead to catastrophic results. Our experts can help you when spring replacement or adjustment is required. Extension springs work by stretching as the door lowers and contracting in order to help it rise back up. They are installed perpendicularly to the door, one on each side. Safety cables are often interwoven into their coils in order to keep them in place when they break, as they are the older of the two types and are far more likely to go flying when this happens. Torsion springs are the newer of the two types. They work by twisting and conveying torque to a pair of drums that wind and unwind lift cables that raise and lower the door accordingly. Springs of this type are often strong and flexible enough that only one unit is used. They are installed horizontally above the panels, across a metal shaft that rotates and twists them up as needed. One of the services we provide is regular garage door maintenance. Springs are a main focus point of this service, as we carefully examine their coils, apply them with the appropriate lubrication and adjust their tension as necessary. All this helps us keep the performance of these crucial components smooth and efficient, and reduces the wear and tear damage they sustain each time you open or close your door. 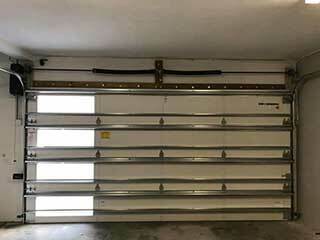 Trying to replace your garage door springs by yourself is a huge mistake, because unless you have all the necessary skills and the professional training required to perform this procedure safely, you could get seriously injured. Instead of risking it, give our team at Garage Door Repair Pearland a call and let our professional technicians take care of any spring related problem you're experiencing.